I unreservedly condemn Edward Snowden's massive release of important U.S. government secrets. Once they're out, though, it makes no sense to ignore the information now available. 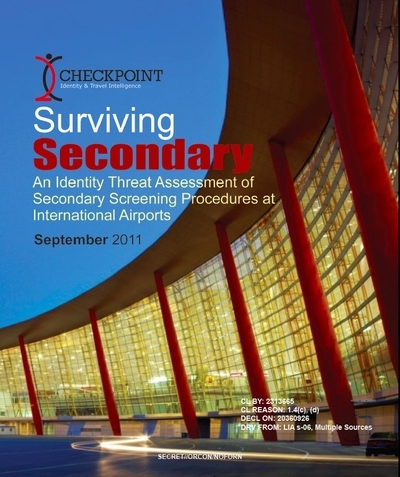 A 14-page document from the Central Intelligence Agency (CIA) carrying the arduous bureaucratic title of Surviving Secondary: An Identity Threat Assessment of Secondary Screening Procedures at International Airports offers a case in point. Translated into normal English, this means, "How undercover agents can avoid trouble when going through passport and custom controls." The cover of the CIA pamphlet, "Surviving Secondary." 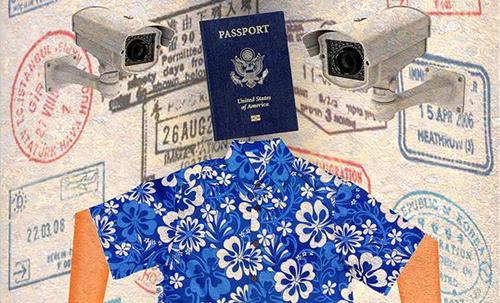 Although the study deals narrowly with the CIA's concern that its clandestine agents will be stopped in passport checks and their false identities exposed, its information holds interest to anyone who travels internationally. Indeed, it's a useful guide precisely to what not to do when landing in a foreign airport. I plan to adopt its advice for my own trips, and, as a public good, I offer some of its main points to other lawful travelers so that they too can better avoid what's known as "secondary screening" – or being plucked from the primary (or routine) line for additional questioning. Travelers sent to secondary screening can enter a Kafkaesque world, potentially for days, in which the usual rules of due process are suspended. Agents may snoop into anything they wish, from copying to confiscating personal electronic devices, from intrusive reviews of one's life to intrusive inspections of one's body. Avoiding such experiences should rank high on any traveler's wish list. The CIA's advice: above all, assume you're being closely watched. To you, passport and customs controls may be minor inconveniences to endure before going about your business; but from the time you leave the airplane cabin until you're spit out of the airport, powerful agencies potentially have you under intense scrutiny – and not just while you are face-to-face with an immigration official. In Mauritius, for example, the local agency uses video cameras "to observe arriving passengers as they exit the aircraft and retrieve their baggage, zooming on individuals' faces to study their expressions." As you make your way from airplane seat to exiting the terminal, the CIA counsels natural and consistent actions. Natural means not displaying unusually nervous behavior such as "shaking or trembling hands, rapid breathing for no apparent reason, cold sweats, pulsating carotid arteries, a flushed face, and avoidance of eye contact." Less obviously, it also means not "switching lines or studying security procedures" nor establishing "secret contact with other passengers" with whom one lacks any apparent ties. How not to appear while traversing passport and custom controls. Consistent means appearing to be who you say you are. Be familiar with the details of your passport, including where you have been. Speak the language of the country issuing your passport. What might seem to be trivial details can be important. For example, "carelessly packed baggage when [the] passenger is purportedly an experienced business traveler" can arouse suspicions, as can the reverse, such as using a business-class ticket for tourist travel. Other non-intuitive red flags include: "An amount of baggage inappropriate for the length of stay." "Multiple new items, such as alarm clocks or notebooks, in baggage." "Unopened and unmarked maps, guidebooks, or other literature." "Maps of unrelated cities in baggage for a purported tourist traveler." "Camera quality not matching the traveler's profile or camera memory card insufficient for a lengthy tourist trip." 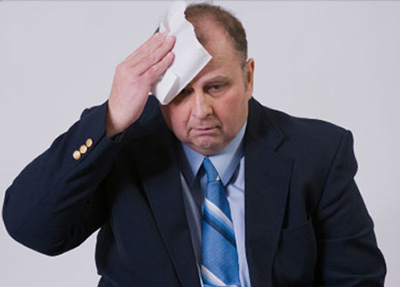 Even if you do everything right, you may still be hauled aside for secondary questioning. First, there is a random element: "many foreign airports have an administrative requirement for a minimum number of random selections." More specifically, "about 12 percent of US-bound passengers are randomly selected for additional screening at overseas airports," meaning that one can expect secondary treatment every eight trips. Second, you may fit some obscure category; a passenger's "language capability, age, appearance, or background" can all prompt extra questioning. In El Salvador, "a military style haircut, physical fitness, casual dress, and little baggage" sufficed to focus attention on a Venezuelan government courier. In Tel Aviv, "military-aged males traveling alone with backpacks [get sent] to secondary screening, regardless of their nationality or skin color." In Egypt, "Christian-Arabs or Jews, human rights or other humanitarian workers, and individuals with advanced scientific degrees" get special attention, and even more so "US-Arabs, particularly US-Egyptians." Running the gauntlet from airplane to street rates as one of the less pleasant experiences of foreign travel. But due care can reduce the chances of provoking the unwanted attention and the tender mercy of aggressive security services. Dec. 31, 2014 addendum: A CIA guide obviously won't apply to U.S. customs. 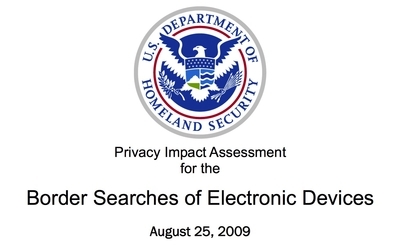 I don't have a document for these but I can refer the reader to U.S. Department of Homeland Security's Privacy Impact Assessment for the Border Searches of Electronic Devices of August 25, 2009. It conveys how, basically, the border authorities, Customs and Border Protection (CBP) and Immigration and Customs Enforcement (ICE) can do anything they wish with your electronics. Collection of this information is mandatory at the time that CBP seeks to copy information from the electronic device. Failure to provide information to assist CBP in the copying of information from the electronic device may result in the detention and/or seizure of the device.